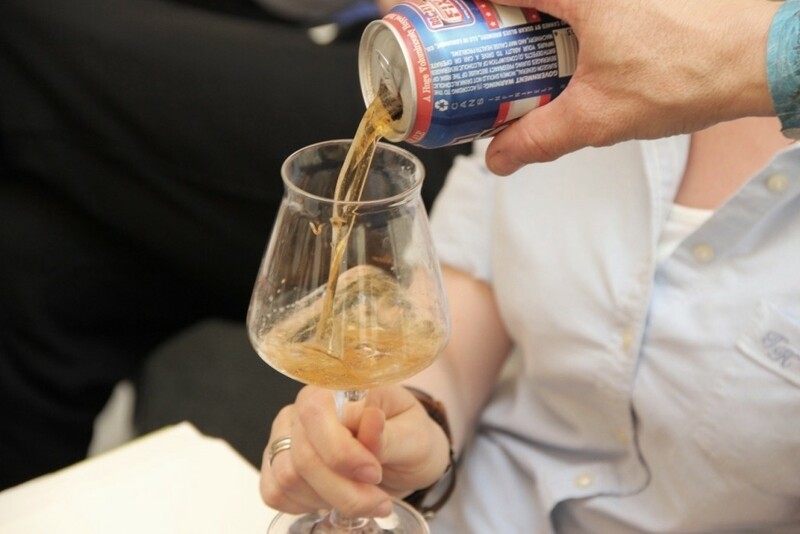 Beerenthusiast Rory Lawton on how to set up the perfect craft beer tasting. PART TWO: Pouring, smelling and tasting craft beer. 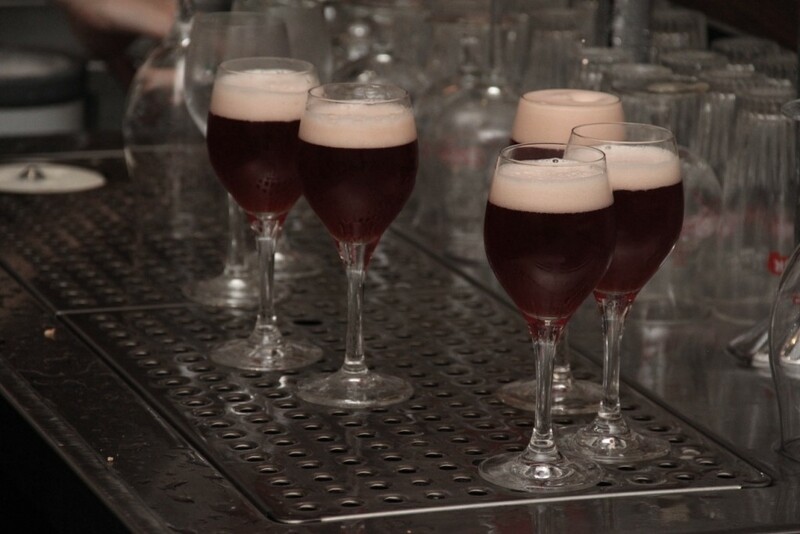 The best pour consists of a slow, continuous motion, half-way down the side of a glass held at a 45˚ angle. If you pouring into multiple glasses, do not bring the bottle upright, but continue to pour with the bottle at an angle. 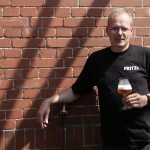 Remember also that many unfiltered beers contain natural yeast sediment at the base of the bottle. This can be substantial for beers that are intended to be bottle conditioned, such as bottles of Belgian ales. For such beer styles with heavy sediment, you want to avoid pouring this into the glass, so leave the last 5-10% of the beer in the bottle. A little known phenomenon that occurs when beer bottles are kept upright for extended periods is the stratification of the beer, where hop oils and proteins collect at the top and bottom of the bottle respectively. When sharing beer from one bottle into multiple glasses, it can be useful to pour this first into a jug that is then distributed to the glasses. Although many will be tempted to raise the glass to their lips immediately, invite your audience to pause and appreciate the appearance of the beer. Depending on the beer style in questions, the colour, opacity and foam tell you a lot about the recipe formulation and the skill of the brewer. The crystal clarity of a pilsner demonstrates the long lagering time – or the efficient filtering process! 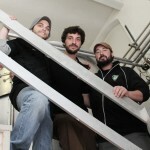 – of modern breweries. 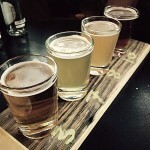 On the other hand, wheat beers such as German Hefeweizen and Belgian witbier should both be cloudy, as the yeast with low flocculation characteristics is an integral part of the style. When examining the appearance of pale ales and IPAs, darker coloures usually indicate a greater percentage of caramel malts in the grain bill. The base malt for these beer styles is usuall a pale ale or pilsner malt, so the colour will shed some light into the recipe formulation of the brewer. The aroma reveals as much about the beer as the flavour, so invite your audience to get their nose stuck in and to inhale deeply. Swirling the glass provides energy, encourages the carbon dioxide to escape from solution, bringing with it volatile aromas. 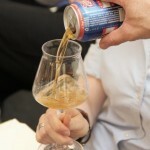 Swirling also increases the surface area of the exposed beer. The combined effects accentuate the aromas of the beer. Freshly brewed pils should have an aromatic hop note, with the mildly spicey Hallertau hops of many German pils characteristic for the style. Beers that have been dry-hopped, like many IPAs, will have a huge nose, particular to the hop type used, while the more subtle characteristics, such as the fruity esters in a Belgian Golden Ale, require more careful searching. At long last, the beer can be tasted. The first mouthful is always the most interesting, so encourage your audience to take their time and savour the experience. Careful attention should be paid to the mouthfeel as well as the flavour evolution on the tongue. Carbonation and body are a part of the style as much as the malt and hop flavours. Guide your audience through the flavour evolution: depending on the beer style, this can run the full gamut from fruity esters that eventually give way to sweet malt notes, followed by a hop bitterness in the finish. 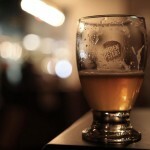 Some beers will finish abruptly, while others will continue to linger on the tongue. 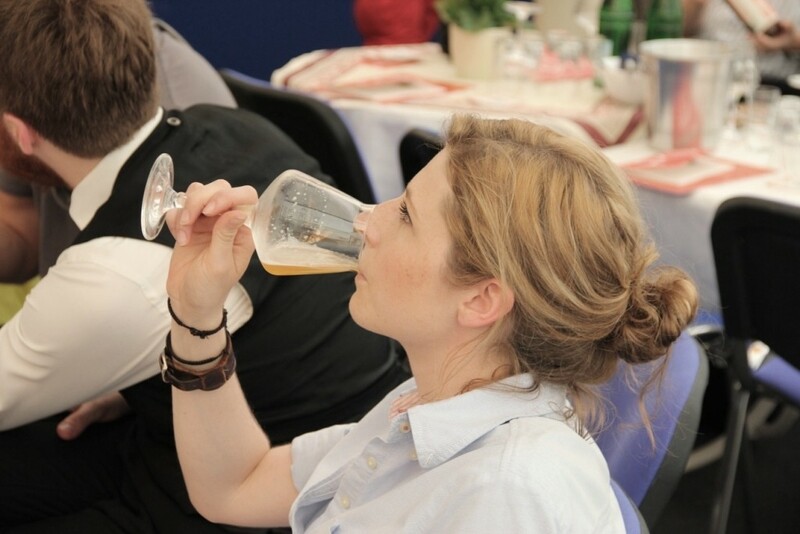 When tasting beer with an audience, give them time to discover their own flavours, before suggesting your own. Encourage your tasters to be imaginative: what do the flavours remind them of. No suggestion should be too outlandish! The coffee and chocolate roasty notes in an imperial stout are easy for your audience to pick up. Somewhat more complex are the rich bread and plum notes in a strong dark Belgian ale, from the special caramel malts and complex ester profile of the yeast. The marmalade notes of an English strong bitter can usually characteristic of the earthy Goldings hops together with English crystal malts. When it comes to hop forward beers such as IPAs, the wealth of new hop varieties that have been emerging in the last decade in particular allow your audience to go to town: citrus, grapefruit, blueberry, menthol, honey-melon, blackcurrant, pomegranate are just a the tip of the iceberg.